Italian mathematician, astronomer, and physicist, made several significant contributions to modern scientific thought. As the first man to use the telescope to study the skies, he amassed evidence that proved the Earth revolves around the Sun and is not the centre of the universe, as had been believed. His position represented such a radical departure from accepted thought that he was tried by the Inquisition in Rome, ordered to recant, and forced to spend the last eight years of his life under house arrest. He informally stated the principles later embodied in Newton's first two laws of motion. Because of his pioneer work in gravitation and motion and in combining mathematical analysis with experimentation, Galileo often is referred to as the founder of modern mechanics and experimental physics. Perhaps the most far-reaching of his achievements was his reestablishment of mathematical rationalism against Aristotle's logico-verbal approach and his insistence that the "Book of Nature is . . . written in mathematical characters." From this base, he was able to found the modern experimental method. Galileo was born at Pisa on February 15, 1564, the son of Vincenzo Galilei, a musician. He received his early education at the monastery of Vallombrosa near Florence, where his family had moved in 1574. In 1581 he entered the University of Pisa to study medicine. While in the Pisa cathedral during his first year at the university, Galileo supposedly observed a lamp swinging and found that the lamp always required the same amount of time to complete an oscillation, no matter how large the range of the swing. Later in life Galileo verified this observation experimentally and suggested that the principle of the pendulum might be applied to the regulation of clocks. Until he supposedly observed the swinging lamp in the cathedral, Galileo had received no instruction in mathematics. Then a geometry lesson he overheard by chance awakened his interest, and he began to study mathematics and science with Ostilio Ricci, a teacher in the Tuscan court. But in 1585, before he had received a degree, he was withdrawn from the university because of lack of funds. Returning to Florence, he lectured at the Florentine academy and in 1586 published an essay describing the hydrostatic balance, the invention of which made his name known throughout Italy. In 1589 a treatise on the centre of gravity in solids won for Galileo the honourable, but not lucrative, post of mathematics lecturer at the University of Pisa. Galileo then began his research into the theory of motion, first disproving the Aristotelian contention that bodies of different weights fall at different speeds. Because of financial difficulties, Galileo, in 1592, applied for and was awarded the chair of mathematics at Padua, where he was to remain for 18 years and perform the bulk of his most outstanding work. At Padua he continued his research on motion and proved theoretically (about 1604) that falling bodies obey what came to be known as the law of uniformly accelerated motion (in such motion a body speeds up or slows down uniformly with time). Galileo also gave the law of parabolic fall (e.g., a ball thrown into the air follows a parabolic path). The legend that he dropped weights from the leaning tower of Pisa apparently has no basis in fact. Galileo became convinced early in life of the truth of the Copernican theory (i.e., that the planets revolve about the Sun) but was deterred from avowing his opinions--as shown in his letter of April 4, 1597, to Kepler--because of fear of ridicule. While in Venice in the spring of 1609, Galileo learned of the recent invention of the telescope. 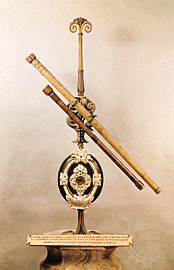 After returning to Padua he built a telescope of threefold magnifying power and quickly improved it to a power of 32. Because of the method Galileo devised for checking the curvature of the lenses, his telescopes were the first that could be used for astronomical observation and soon were in demand in all parts of Europe. As the first person to apply the telescope to a study of the skies, Galileo in late 1609 and early 1610 announced a series of astronomical discoveries. 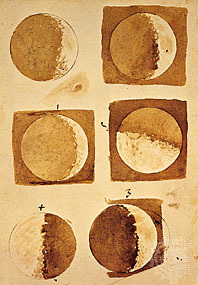 He found that the surface of the Moon was irregular and not smooth, as had been supposed; he observed that the Milky Way system was composed of a collection of stars; he discovered the satellites of Jupiter and named them Sidera Medicea (Medicean Stars) in honour of his former pupil and future employer, Cosimo II, grand duke of Tuscany. He also observed Saturn, spots on the Sun, and the phases of Venus . His first decisive astronomical observations were published in 1610 in Sidereus Nuncius ("The Starry Messenger"). 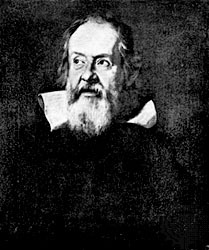 Although the Venetian senate had granted Galileo a lifetime appointment as professor at Padua because of his findings with the telescope, he left in the summer of 1610 to become "first philosopher and mathematician" to the grand duke of Tuscany, an appointment that enabled him to devote more time to research. In 1611 Galileo visited Rome and demonstrated his telescope to the most eminent personages at the pontifical court. Encouraged by the flattering reception accorded to him, he ventured, in three letters on the sunspots printed at Rome in 1613 under the title Istoria e dimostrazioni intorno alle macchie solari e loro accidenti . . . , to take up a more definite position on the Copernican theory. Movement of the spots across the face of the Sun, Galileo maintained, proved Copernicus was right and Ptolemy wrong. His great expository gifts and his choice of Italian, in which he was an acknowledged master of style, made his thoughts popular beyond the confines of the universities and created a powerful movement of opinion. The Aristotelian professors, seeing their vested interests threatened, united against him. They strove to cast suspicion upon him in the eyes of ecclesiastical authorities because of contradictions between the Copernican theory and the Scriptures. They obtained the cooperation of the Dominican preachers, who fulminated from the pulpit against the new impiety of "mathematicians" and secretly denounced Galileo to the Inquisition for blasphemous utterances, which, they said, he had freely invented. Gravely alarmed, Galileo agreed with one of his pupils, B. Castelli, a Benedictine monk, that something should be done to forestall a crisis. He accordingly wrote letters meant for the Grand Duke and for the Roman authorities (letters to Castelli, to the Grand Duchess Dowager, to Monsignor Dini) in which he pointed out the danger, reminding the church of its standing practice of interpreting Scripture allegorically whenever it came into conflict with scientific truth, quoting patristic authorities and warning that it would be "a terrible detriment for the souls if people found themselves convinced by proof of something that it was made then a sin to believe." He even went to Rome in person to beg the authorities to leave the way open for a change. A number of ecclesiastical experts were on his side. Unfortunately, Cardinal Robert Bellarmine, the chief theologian of the church, was unable to appreciate the importance of the new theories and clung to the time-honoured belief that mathematical hypotheses have nothing to do with physical reality. He only saw the danger of a scandal, which might undermine Catholicity in its fight with Protestantism. He accordingly decided that the best thing would be to check the whole issue by having Copernicanism declared "false and erroneous" and the book of Copernicus suspended by the congregation of the Index. The decree came out on March 5, 1616. On the previous February 26, however, as an act of personal consideration, Cardinal Bellarmine had granted an audience to Galileo and informed him of the forthcoming decree, warning him that he must henceforth neither "hold nor defend" the doctrine, although it could still be discussed as a mere "mathematical supposition." For the next seven years Galileo led a life of studious retirement in his house in Bellosguardo near Florence. At the end of that time (1623), he replied to a pamphlet by Orazio Grassi about the nature of comets; the pamphlet clearly had been aimed at Galileo. 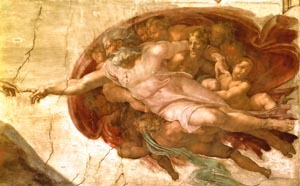 His reply, titled Saggiatore . . . ("Assayer . . . "), was a brilliant polemic on physical reality and an exposition of the new scientific method. In it he distinguished between the primary (i.e., measurable) properties of matter and the others (e.g., odour) and wrote his famous pronouncement that the "Book of Nature is . . . written in mathematical characters." The book was dedicated to the new pope, Urban VIII, who as Maffeo Barberini had been a longtime friend and protector of Galileo. Pope Urban received the dedication enthusiastically. In 1624 Galileo again went to Rome, hoping to obtain a revocation of the decree of 1616. This he did not get, but he obtained permission from the Pope to write about "the systems of the world," both Ptolemaic and Copernican, as long as he discussed them noncommittally and came to the conclusion dictated to him in advance by the pontiff--that is, that man cannot presume to know how the world is really made because God could have brought about the same effects in ways unimagined by him, and he must not restrict God's omnipotence. These instructions were confirmed in writing by the head censor, Monsignor Niccol Riccardi. Galileo returned to Florence and spent the next several years working on his great book Dialogo sopra i due massimi sistemi del mondo, tolemaico e copernicano (Dialogue Concerning the Two Chief World Systems--Ptolemaic and Copernican). As soon as it came out, in the year 1632, with the full and complete imprimatur of the censors, it was greeted with a tumult of applause and cries of praise from every part of the European continent as a literary and philosophical masterpiece. On the crisis that followed there remain now only inferences. It was pointed out to the Pope that despite its noncommittal title, the work was a compelling and unabashed plea for the Copernican system. The strength of the argument made the prescribed conclusion at the end look anticlimactic and pointless. The Jesuits insisted that it could have worse consequences on the established system of teaching "than Luther and Calvin put together." The Pope, in anger, ordered a prosecution. The author being covered by license, the only legal measures would be to disavow the licensers and prohibit the book. But at that point a document was "discovered" in the file, to the effect that during his audience with Bellarmine on February 26, 1616, Galileo had been specifically enjoined from "teaching or discussing Copernicanism in any way," under the penalties of the Holy Office. His license, it was concluded, had therefore been "extorted" under false pretenses. (The consensus of historians, based on evidence made available when the file was published in 1877, has been that the document had been planted and that Galileo was never so enjoined.) The church authorities, on the strength of the "new" document, were able to prosecute him for "vehement suspicion of heresy." Notwithstanding his pleas of illness and old age, Galileo was compelled to journey to Rome in February 1633 and stand trial. He was treated with special indulgence and not jailed. In a rigorous interrogation on April 12, he steadfastly denied any memory of the 1616 injunction. The commissary general of the Inquisition, obviously sympathizing with him, discreetly outlined for the authorities a way in which he might be let off with a reprimand, but on June 16 the congregation decreed that he must be sentenced. The sentence was read to him on June 21: he was guilty of having "held and taught" the Copernican doctrine and was ordered to recant. Galileo recited a formula in which he "abjured, cursed and detested" his past errors. The sentence carried imprisonment, but this portion of the penalty was immediately commuted by the Pope into house arrest and seclusion on his little estate at Arcetri near Florence, where he returned in December 1633. The sentence of house arrest remained in effect throughout the last eight years of his life. Although confined to his estate, Galileo's prodigious mental activity continued undiminished to the last. In 1634 he completed Discorsi e dimostrazioni mathematiche intorno a due nuove scienze attenenti alla meccanica (Dialogue Concerning Two New Sciences), in which he recapitulated the results of his early experiments and his mature meditations on the principles of mechanics. This, in many respects his most valuable work, was printed by Louis Elzevirs at Leiden in 1638. His last telescopic discovery--that of the Moon's diurnal and monthly librations (wobbling from side to side)--was made in 1637, only a few months before he became blind. But the fire of his genius was not even yet extinct. He continued his scientific correspondence with unbroken interest and undiminished acumen; he thought out the application of the pendulum to the regulation of clockwork, which the Dutch scientist Christiaan Huygens put into practice in 1656; he was engaged in dictating to his disciples, Vincenzo Viviani and Evangelista Torricelli, his latest ideas on the theory of impact when he was seized with the slow fever that resulted in his death at Arcetri on January 8, 1642. The direct services of permanent value that Galileo rendered to astronomy are virtually summed up in his telescopic discoveries. His name is justly associated with a vast extension of the bounds of the visible universe, and his telescopic observations are a standing monument of his ability. Within two years after their discovery, he had constructed approximately accurate tables of the revolutions of Jupiter's satellites and proposed their frequent eclipses as a means of determining longitudes on land and at sea. The idea, though ingenious, has been found of little use at sea. His observations on sunspots are noteworthy for their accuracy and for the deductions he drew from them with regard to the rotation of the Sun and the revolution of the Earth. A puzzling circumstance is Galileo's neglect of Kepler's laws, which were discovered during his lifetime. But then he believed strongly that orbits should be circular (not elliptical, as Kepler discovered) in order to keep the fabric of the cosmos in its perfect order. This preconception prevented him from giving a full formulation of the inertial law, which he himself discovered, although it usually is attributed to the French mathematician Ren Descartes. Galileo believed that the inertial path of a body around the Earth must be circular. Lacking the idea of Newtonian gravitation, he hoped this would allow him to explain the path of the planets as circular inertial orbits around the Sun. The idea of a universal force of gravitation seems to have hovered on the borders of this great man's mind, but he refused to entertain it because, like Descartes, he considered it an "occult" quality. More valid instances of the anticipation of modern discoveries may be found in his prevision that a small annual parallax would eventually be found for some of the fixed stars and that extra-Saturnian planets would at some future time be ascertained to exist and in his conviction that light travels with a measurable although extremely great velocity. Although Galileo discovered, in 1610, a means of adapting his telescope to the examination of minute objects, he did not become acquainted with the compound microscope until 1624, when he saw one in Rome and, with characteristic ingenuity, immediately introduced several improvements into its construction. A most substantial part of his work consisted undoubtedly of his contributions toward the establishment of mechanics as a science. Some valuable but isolated facts and theorems had previously been discovered and proved, but it was Galileo who first clearly grasped the idea of force as a mechanical agent. Although he did not formulate the interdependence of motion and force into laws, his writings on dynamics are everywhere suggestive of those laws, and his solutions of dynamical problems involve their recognition. In this branch of science he paved the way for the English physicist and mathematician Isaac Newton later in the century. The extraordinary advances made by him were due to his application of mathematical analysis to physical problems. Galileo was the first man who perceived that mathematics and physics, previously kept in separate compartments, were going to join forces. He was thus able to unify celestial and terrestrial phenomena into one theory, destroying the traditional division between the world above and the world below the Moon. The method that was peculiarly his consisted in the combination of experiment with calculation--in the transformation of the concrete into the abstract and the assiduous comparison of results. He created the modern idea of experiment, which he called cimento ("ordeal"). This method was applied to check theoretical deductions in the investigation of the laws of falling bodies, of equilibrium and motion on an inclined plane, and of the motion of a projectile. The latter, together with his definition of momentum and other parts of his work, implied a knowledge of the laws of motion as later stated by Newton. In his Discorso intorno alle cose che stanno in su l'acqua ("Discourse on Things That Float"), published in 1612, he used the principle of virtual velocities to demonstrate the more elementary theorems of hydrostatics, deducing the equilibrium of fluid in a siphon, and worked out the conditions for the flotation of solid bodies in a liquid. He also constructed, in 1607, an elementary form of air thermometer.